Historic Yates Mill County Park is truly a hidden gem within the Greater Raleigh area. The 174-acre wildlife refuge, pond and environmental research center functions as a public park, located only five miles from downtown Raleigh. Yates Mill Park offers excellent opportunities for a range of outdoor activities as well as cultural and educational experiences. On a sunny day at any time of year, head out to Yates Mill for a day of hiking or fishing and bring a picnic to share with friends in the garden. Experience rich environmental, agricultural or cultural learning among the wildlife, delve into the educational exhibits conveniently located throughout the park’s grounds, and practice your photography skills in the picturesque setting that is Yates Mill Park. 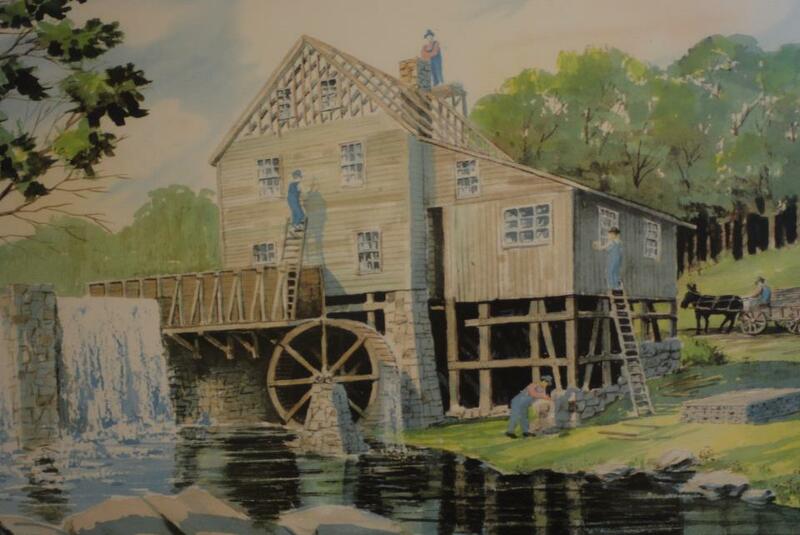 The visual focus of the park is the massive water-powered gristmill that served Wake County for more than 200 years, from around 1756 until the early 20th century. There were once 70 gristmills operating in Wake County, and Yates Mill is the one and only mill still in operating condition. The gristmill remains a functioning piece of equipment, and visitors to the park can buy their own bags of Yates Mill stone-ground cornmeal to take home to concoct culinary artwork. Just as the old gristmills served as a social gathering hotspots for rural citizens, Yates Mill is a popular location to gather with friends and family to enjoy the outdoors and partake in a bit of relaxation. The park’s mission is to cherish our great state of N.C.’s past heritage and to nurture its resources for future generations. 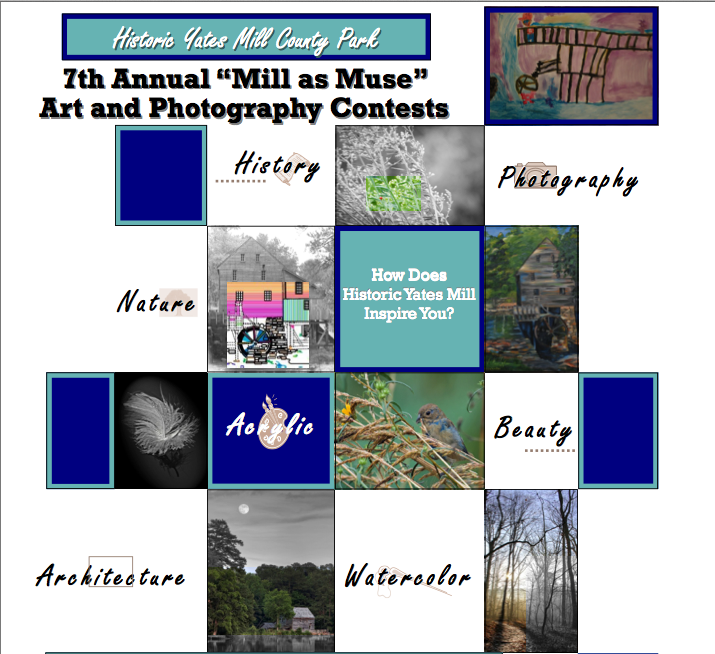 Yates Mill County Park will host the 7th Annual “Mill as Muse” Community Art and Photography Contests in early Feb. 2013. Artists of all ages are invited to ready their cameras or artistic media of choice to portray this historic park which has served as artistic inspiration for more than two centuries. Participants are encouraged to draw inspiration from the Mill itself, the surrounding park, as well as local flora and fauna. You can grab an Art Entry Form or Photo Entry Form on the website and submit your creation between Jan. 23 and Feb. 3. The masterpieces will be judged on Feb. 9, and an artist’s reception will follow for all participants. Winners will have their works on display in the Yates Mill Visitor’s Center through May 2013. Guided tours of Yates Mill are available during the of Mar. through Nov. Get schooled on a Local History Tour, take a step back in time during a corn-grinding demonstration, or become a super sleuth during a Kids’ History Detective Tour. The park is a part of the Raleigh Heritage Trail, which promotes the understanding of the history of the greater Raleigh area through historic sites, local museums and other facilities. In addition to Yates Mill County Park, the Trail includes important Raleigh landmarks such as Haywood Hall and Gardens, the N.C. State Capitol, Mordecai Historic Park and many more. Get your passport today!